Things I liked: These fit great over my prescription glasses without touching my glasses. I shot at the gun range for almost 2 hours and they were very comfortable. Things I liked: sturdy. But they do not fit over eyeglasses. Things I would have changed: That they actually would fit over eyeglasses. What others should know: If you wear eyeglasses these WILL NOT work! Things I liked: Plastic is very clear with no distortion. Will fit an adult or young child. What others should know: A must have for shooting any gun Airsoft, Paintball, BB's Pellets and of course any firearms. Things I would have changed: Great for the price. What others should know: A clear view. Wear them. Things I liked: Inexpensive, fits well over my glasses, ample ventilation slots. Things I liked: Fits nicely over my prescription glasses. Minimal distortion. What others should know: Expect a little minor distortion that does not obstruct your aim. What others should know: Nice, inexpensive, and effective. Great coverage. Hope I never need to put them to the test with a powerful ricochet. Just nice to have at a shooting range or when plinking hard targets. Things I liked: Provide added protection for folks like me who wear prescription lenses. 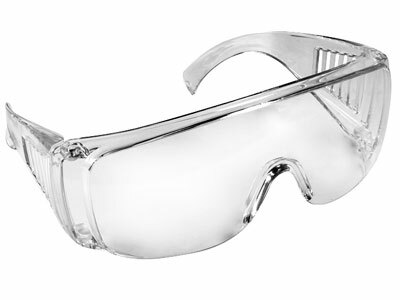 A must for youngsters who wear glasses or people who don't have polycarbonate or other impact resistant lenses. Also filters UVA / UVB. Things I would have changed: These aren't optical quality; they add some distortion to your view. How much distortion is too much? What others should know: I have a large head (save the wisecracks) e.g. I wear a size 7-7/8 or 8 hat. The frames press against the side of my head. I'll need to take them off from time to time. Thanks for putting these in stock.